Nothing quite clears out the sinuses like a good dose of Malathion aerosol being sprayed from a mobile spray rig in the back of a pickup truck. This seems to happen mostly around sunrise and if memory serves, about weekly during most times of the year. I'm not sure if there's just one pickup doing it, or if there's a whole fleet of them involved. I think regular spraying by these things started right after Hurricane Dean. Rumor had it that the spraying at that time was paid for by the Mexican government, who wanted to keep mosquitoes from blowing across to Mexico. That was the rumor anyway. I doubt that the Mexican government is still paying for the spraying. I don't know if it's something the Belize government is paying for or if there is some other benefactor. In any case, I know mosquito abatement is something that is necessary and that it must be sprayed in the most efficient and cost-effective way possible. I just wish there was some way to avoid having to breath the vapors. You might say, well, stay out of the way of the spray rig, stay upwind. Even if we weren't walking, it's tough to do. On the days the rig comes through our neighborhood, if the wind is blowing the right way, even if we had our louvers closed, the odor of Malathion still manages to permeate the house. In short, there's really no way to escape it. This morning, we were on our way back from town, just passing Abel's Mystical Mayan Massage Emporium (left side of the picture above) when we noticed the truck turning onto the road. I had wanted to get a picture of the rig for a long time now and this was the first opportunity where I was able to get my brain in gear and grab the camera out of my waist pack (thereby avoiding calling it a fanny pack or bum bag, so as not to offend anyone) and actually take a picture of the rig at work. As it was, you can see I dang near missed it again. If you click on it and expand the thumbnail image, you can see the cloud of Malathion up toward the top of the photo. Not the brown cloud at the bottom, that's exhaust and carbon being expelled by the engine. A real twofer experience. According to Wikipedia, Malathion is a chemical of relatively low-toxicity to humans. It's used in the U.S. and Canada for mosquito control, and other pest control programs. I believe it is used in Washington State for various vector control spraying programs. Having said that, I just don't remember being exposed to such a high-strength spray before. Maybe I'm just getting more sensitive as the years go by. I just wish it would kill the doctor flies. I didn't know about those doctor flies. Pretty nasty little girls. Are they a problem around your place? The search said they prefer a more forested area and your place is kinda open. Do you have wasps or other flying insects come and drink from your pool? At different times during the year doctor flies come around for a week or two. During those times they are a real pain. It seems mostly when you're resting, like on the front porch or a couple of times, on a floatie in the pool. They never seem to bother you when just walking. I wish the GOB would nail the little buggers - practicing without a license! While growing up in Colorado I remember the mosquito spraying trucks and how the smell would linger. Haven"t had a chance to read your blog lately due to the Dec. snow storm and Jan. flood season here in WA. (a Presidential in progress) Finally took a rainy friday off and got to catch up on all your events. Nice looking guest house-- Y R really developing great "digs" and it's been how long since the start? Dianna looks fantastic, happy and all tan !! I'm still getting use to your ponytail and facial hair (snowshoe who?) Y both look great, relaxed, and layed back---so green w/ envy. Y stated Y wanted a heavy duty vice, could I order one from Sears and send it to Y for your new workshop? Will try to keep up my reading of the blog on a weekly basis instead of a monthly one. As a child (50 plus years ago) we used to ride in & out of the fog truck's malthion cloud as it transitted our Gainesville, Fl neighborhood in the summer evenings. The warts I have at this stage aren't from that I can assure you! The residual from the spraying is still unpleasant. About 20 years ago I lived on Marco Island and old DC3's sprayed the mangroves, us, and the beaches three to four times a week, from about 100 feet. I got to understand how the folks in Hawaii felt when the Japs came into Pearl at treetop level.. never got used to that! Happy hour drinks tasted funny for about twelve hours afterwards! 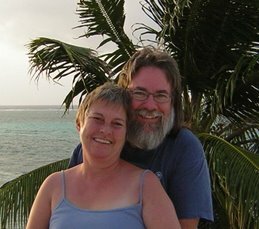 We had cruised several times in the E. Caribbean islands and fell in love with them. Couldn't afford to live there so we searched for an alternative. This place called "Belize" kept popping up on my Google searches. It sounded right, English speaking, parliamentary government, the Queen on coins and bills, relatively affordable, you could drive down here (we didn't). We came down for a 30-day look-see. As we were stepping off the plane, we knew we were home. Three days later, we bought our property and never looked back.